Hands-on clinic for new and beginning women shooters covering safety and shooting fundamentals with pistol, rifle, shotgun instruction, archery and more. 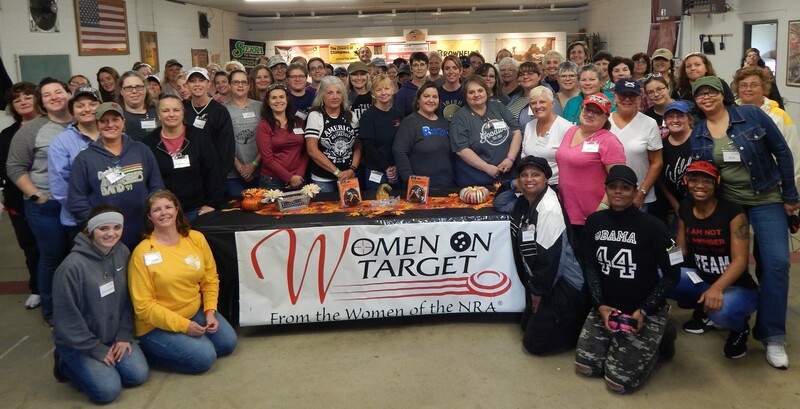 We had another fantastic day on the range even while shooting in the rain…74 ladies attended this year's clinic and learned gun safety first then were given a chance to shoot a variety of firearms & archery on 5 different ranges including a Vickers Machine Gun – again this year! The 80+ instructors & helpers did an amazing job teaching, coaching and keeping everyone safe on the range! Here are a few comments from our attendees: "Wonderfully organized & a TON of fun! ", "Absolutely wonderful experience", "Thank you for all your hard work & gracious attitude - this was a wonderful fun-filled experience! ", "Rain didn't seem to dampen anyone's fun - would love to do this more often! ", "This was phenomenal, excellent atmosphere, friendly staff & extremely informative - I will be back! ", "With all that is going on in the country, I want to 'Be Ready' but most of all I love to shoot! ", "Fantastic day - all women should attend this! ", Every instructor & group leader was knowledgeable, helpful, patient, kind & just awesome! ", "My favorite day of the year! ", "Everything was very organized, informative & fun! ", "I arrived somewhat fearful but never felt a bit of fear when I stepped on the 1st range which was the sub-gun!" "Great introduction to firearms of all types! Greatly appreciate all the time, effort & supplies that went into this event. ", "Everything ran so smooth & everyone was so helpful & nonjudgmental - they truly want us here! ", Everyone was very approachable & professional! ", "Definitely bringing new ladies back next year! ", "Thank you for the commitment & involvement to make this happen!" Our Clinic this year would not have been possible without the substantial funding from THE NRA FOUNDATION through grants from the Dover-New Phila Friends of the NRA! Donations & contributions were gratefully received as well from: Tusco Rifle Club, All American Outdoors, Bonifay Heating & Cooling, Buckeye Firearms Association, Charter Firearms, Dawson Enterprises, Fin Feather Fur Outfitters, Gun Goddess, Kames Sports, Keeping You in Stitches, Miller’s Gun, Ohio Armament, Paul Diegmiller, Pyramid Air, Ruger, The Garden Gurl Shop, The Well-Armed Woman, Tina Wisse & TuscValley Practical Firearms Training! We would like to thank our Many Exceptional Volunteers who gave of their time and resources to make our clinic a safe & educational experience that the ladies will not soon forget: Dan Adams, Derek (Colt) Albright, Hunter Albright, Tony Allen, Chris Andrews, Ben Baker, Anne Baker, Jenny Bargar, Tim Bargar, Joe Bosio, John Bosio, Lynn Bosio, Sarah Bosio, Kevin Brooks (Chubz), Ray Brumme, Ron Carpenter, Heather Charton, John Craig, Val Craig, Gerrel D, Paul Diegmiller, Doug Dillon, Jim Eichel, Sonja Eichel, Alexis Ferriot, Greg Fisher, Kathryn Fox, Samantha Fuller, Christina Furney, Jerry Garvey, Vonda Garvey, Brent Hanks, Carol Hanks, Claude Hanks, Bill Hawkins, Carrie Hoffman, Jane Hoover, Tina Hoover, Christina Hysong, Tara Ireland, Tom James, Brian John (Moose), Tom Kaderly, Candice Kocsis, Jeremiah Kocsis, Chuck Laizure, Matt Lampe, Peggy Lawver, Rich Lawver, Mike Legg, Colton Lehman, Greg Lehman, Steve M, Brian Minor, Robert Mitzel, Pat Moody, John Parson, Jim Phelps, Barry Pinkerton, Brian Pinkerton, Bonny Pitt, Wendy Popham, David Reese, Scott Reynolds, Brian Rossow, Nancy Scaffidi, Pete Schandel, Dakota Schandel, Bob Scofield, Ed Skerness, Joe Skinner, Charles Steving, Lisa Stucky, Bill Tinlin, Susan Tinlin, Carl Uhl, Jim Utter, Bruna Weber, Craig Weber, MacKenzie Weber & Ryan Yoss! Select one of the dates below to see pictures from that event!